One of my favourite resources for research into systems and angles and a great source of ideas is the Betting Insiders Club. 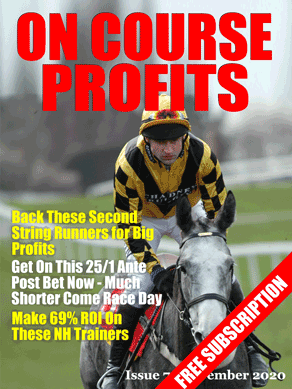 Every month they send out a 50 page report packed with systems, winning profiles, horses to follow and winning strategies and to my mind it is excellent value for money. They also regularly have trials of up and coming tipsters and systems and they currently have a football tipster who has made 130 points profit in the last 40 days. With all tips given out to Insiders Club members the night before each match. Added to that the club has recently started sending out tips from their systems every day, these tips started on July 1st and so far they are 36.96 points up, which goes to show the quality of the systems and methods they produce. Now I should tell you that there is a connection between the management of this website and Betting Insiders but today that's a good thing because I've managed to persuade the boss to give me a huge discount coupon. This code will give 50 lucky readers a full 40% off of any subscription at the Betting School Insiders Club. If you take the annual option that reduces down to just £143.99 for a year which is just £11.99 per month. Also if you take the annual option Betting Insiders will send you a full set of back issues for the 1st 8 reports already published this year along with a nifty binder to store them in. £11.99 per month for winning tips and for new systems and strategies every month is an absolute bargain. Select your subscription plan from the drop down menu, then make sure the coupon code is in the coupon box. When you get to the payment page your 40% discount will be deducted. I'm just back in the country and catching up on my emails etc, so if you've mailed me I will get to you soon! Today I want to remind you about the Tote 10 to Follow competition where you can win £50,000 plus a monthly prze of £2,500. First though I've just heard that there are 7 more places available with the coupon to the Betting Insiders Club, here's a reminder of the details. Although the scoring started on Saturday for the Tote 10 To Follow you can still pick a stable anytime up to Midday on May 31st. Obviously the sooner you enter your stable the more points you will accumulate so I would strongly recommend that you get your entries in this week. Ideally you want horses that will be winning Group races and there are bonus points for the big races of the season. With the Epsom festival hosting the next bonus races in the Coronation Cup, The Oaks and The Derby. For £5 the Ten to Follow is a great way to have an interest all season – Tote Ten To Follow. We finish of our week of Betting Insiders features with an article from Jakub Gawel who is one of the Betting Insiders football betting and trading correspondants and who shares systems and strategies in the Betting Insiders report every month. This month I shared my research into the influence referees can have on the outcome of football games and detailed stats that demonstrate that some refs favour certain teams. These biases may be unintentional and let's assume they are but nevertheless they exist and we can profit from them. Today I'm going to share one particular bias that I have uncovered which featured in my Betting Insiders article this month. Human factor – If you think about football refereeing as a job, it seems to be a very lonely one, often being abused verbally and even physically at times by players, managers and fans. At the end of the day, a ref is a human being who has feelings, likes and dislikes. The ref should always remain fair and unbiased but is it safe to say, that even they will have their most/least favourite clubs/stadiums. This quote was taken from one of the interviews with professional refs, which were supposed to promote this choice of career. After reading this statement, I checked the League stats for Everton when they played under Marriner. According to Andre Marriner, 38, who joined the elite list of Premier League refs in 2004, the rewards are manifest. ‘For me there’s nothing better than being a referee,’ he says. ‘I was at Everton the other day, one of my favourite grounds, and the atmosphere was amazing. On checking the stats I found that Everton lost only 4 out of their 21 matches under Marriner, 15 of those took place at Goodison Park (a bit many you would think) and Everton lost only 2 (against Newcastle and Blackburn). But nothing interesting in terms of penalty and red card favour. However, it’s noticeable that the Toffees were on average booked less often than their opposition. But looking at my stats, Mr Marriner is the ‘luckiest’ match official for the team from the blue half of Liverpool. Looking at Everton and other refs’ stats, there are some match officials who aren’t very ‘lucky’ for the Toffees, for example Martin Atkinson (19 Premier matches and only 4 wins for Everton) or Mike Jones (1 win in 10 matches). Whether it’s just a fluke or a strong trend, it can’t be ignored when it comes to betting or trading. This is just one trend that I uncovered, but there are a whole host of factors effected by the allocated referee. Have you ever heard a manager or pundit state that bad penalty decisions even themselves over the course of a season? My penalties league table strongly suggests otherwise. Some high profile teams have many more penalties awarded for them than against. And for some of the less glamourous Premier League teams it unfortunately doesnt come close to evening out. The influence of the referee on a game is a huge factor that you should consider in your betting and one that is under-utilised by the majority, which means value for us. Today's guest article is from Betting Insiders contributor Mark Jenkins. Mark is a full time arber and targets a weekly tax free profit of £1,000 from his arbs. There are many arbitrage techniques, but generally speaking the more you can break an outcome down the better your chances of finding a money making opportunity. One of my personal favourites is using HT/FT odds to cover the draw. For example one recent match saw the best odds available on the draw as 12/5 (3.40 decimal). By taking the best available HT/FT odds you could achieve 3.51. You are only interested in the draw at full time so you need to cover the outcomes as follows. 1) Home team at halftime draw at fulltime. 2) Draw at halftime draw at fulltime. 3) Away team at halftime draw at fulltime. Then whatever is happening at halftime the draw is covered at fulltime. The odds were, 18/1 (19.00), 9/2 (5.50) and 19/1 (20.00). It is easy to calculate, again we need to turn the odds to a % so 100/19 + 100/5.5 +100/20 = 28.44% then divide 100 by the % to get the relevant decimal odds 100/28.44% = 3.516. Now that might not seem like much of an improvement but in arbitrage terms it makes a 1% trade into a 2.5% one and that is a BIG improvement. Making money through arbitrage is just one way that I make money, there are the regular bonuses offered by the bookmakers to take advantage of, and the little incentives, such as the 1% cash back currently offered by Skrill (formerly Moneybookers), where just by depositing into a bookmaker 1% is given back by way of points that can be cashed in for actual money, this is another way of profiting from your arbitrage activities, making a 0% arb into a profitable trade if you have to deposit. One of my arbitrage colleagues actually moves his money around every Monday morning to make profits from this incentive. You can read more of Mark's strategies for risk free cash, including how he made a risk free 75% on an arb, in this months Betting Insiders report.